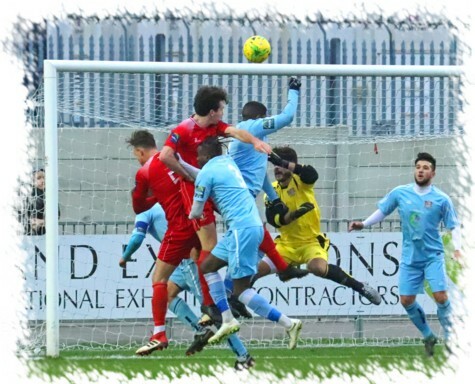 United started 2019 with a victory just as the previous year had finished but only two goals came the way of Paul Hughes' Hayes & Yeading side this time around against an ultra defensive Molesey side at the SKYex. United made three changes from the final starting XI of 2018. Ed Asafu-Adjaye and Duncan Culley coming from the bench in place of George Spiers and the injured Josh Chamberlain while a change between the sticks saw Andrew McCorkell replaced by the returning Charlie Burns, the stopper who spent a previous loan spell with United 3 years ago having re-signed from Hampton & Richmond Borough this week. United were to pretty much control possession for the majority of the ninety minutes with a couple of early openings coming around the six minute mark. 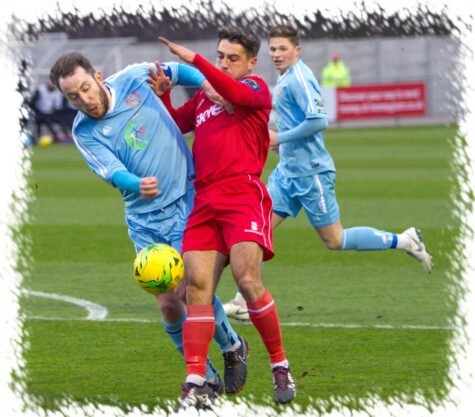 Scott Donnelly and Toby Little combined on the left, the latter whipping in a cross that Elliot Benyon met with a header that was wide of the target. This was quickly followed by Scott Bridges winning the ball in the middle of the park before playing it forwards to Duncan Culley who saw his low shot held by visiting 'keeper Alex Kozakis. United continued to press for an opener. Donnelly found Little with a short corner, his deep cross picked out Liam McDevitt but his header just cleared the Moles crossbar and a few minutes later Bridges, Culley and Lee Barney worked a neat opening for Donnelly who saw his shot pushed wide by Kozakis. In the twentieth minute Kozakis again denied United, McDevitt recovered possession at the far post after another short corner routine, his cross round Benyon but the Moles stopper did well to hold the United mans' header at the foot of the post. Six minutes later though United did finally break through when Little lofted the ball over the centre of the visitors defence to Culley, the United striker executing a perfect first time lob over Kozakis to give Paul Hughes' side a 26th minute lead. Five minutes later Charlie Burns finally "got his hands on the ball" when Donnelly charged down an Andrew Mensah shot on the edge of the box giving the United stopper the easy task of picking up the loose ball. Two further chances came United's way before the break. Little fed Donnelly on the left, the United skipper finding Culley in the box but his drive was wide of the target. Within seconds another Donnelly pass, this time to Bridges saw the midfield man flick the ball neatly on to Barney who could not keep his effort down and it was 1-0 at half-time. The second half was to be no different with United dominating the ball with the back line pretty much snuffing out any attacking notions the Moles may have had without Burns being troubled in the slightest. First to test Kozakis after the break was Bridges, Asafu-Adjaye won possession and sent Little away, his pull back to Bridges presented a shooting opportunity that was executed but the shot was held by the diving Kozakis. Culley and Benyon set up a chance for Barney but his drive was well defended by Craig Lewington and three minutes later Asafu-Adjaye tried his luck from fully 30 yards with Kozakis tipping the effort around the post. Goal number two finally came just before the hour mark and was similar to the first, this time a nice lofted through ball from Bridges found Barney who expertly lobbed Kozakis for his 25th strike of the season. With three quarters of the game played, Donnelly sprayed the ball wide to Little, the free scoring wing back cutting into the Moles area before hitting a shot that only found the side netting of the visitors goal. Three further chances came in the dying minutes, not surprisingly all to the home side. Bridges met a Little corner but couldn't keep his header down and this was quickly followed by Bridges finding substitute Ash Nzala in the box, he turned his marker who then recovered enough to take the sting out of the shot which made it easy for Kozakis to gather. The final chance came in stoppage time when Bridges fed another substitute, Rylan Myers, on the right side. 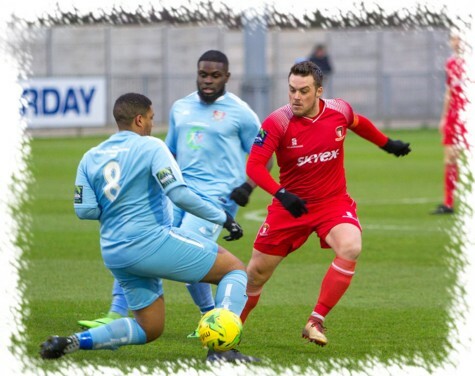 He squared to Little in the centre of the area but his shot on the turn was too high and United had to settle for a 2-0 victory that sees Hayes & Yeading stay sitting pretty at the pinnacle of the South Central Division. 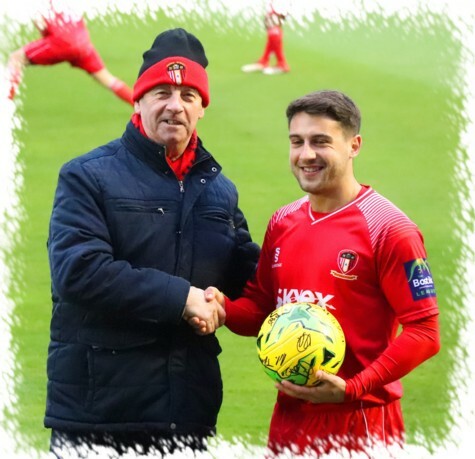 Lee Barney collecting his third signed hat-trick ball of the season from club stalwart Martin Warn. Photos by Montimagemedia (top 2) & Ray Peploe (bottom 2). United Man of the Match: Roddy Collins.